We fell hard for the adorable rabbit and hedgehog clocks from Decoy Lab, but did you know that Decoy Lab offers many other sweet animal clocks as well? For example, the super fun and unique hippo clock shown above. There’s also a prancing fawn, wise ol’ owl, friendly lion and more. Each clock is beautiful handcrafted from eco-friendly 3-ply bamboo and feature pretty contrasting white hands. Clock surfaces are finished with natural oils for a smooth, polished look. Because bamboo pieces are naturally different, each clock features one-of-a-kind grains and colors. All clock motors are silent and made in USA. Decoy Lab uses all recyclable and reusable packaging materials too. Best of all, these eco-friendly clocks are whimsical enough for a child, but not childish, meaning they’ll work well for your child’s room as he grows. Where can I purchase the hippo clock? We fell hard for the adorable rabbit and hedgehog clocks from Decoy Lab, but did you know that Decoy Lab offers many other sweet animal clocks as well? For example, the super fun and unique hippo clock shown above. There's also a prancing fawn, wise ol' owl, friendly lion and more. 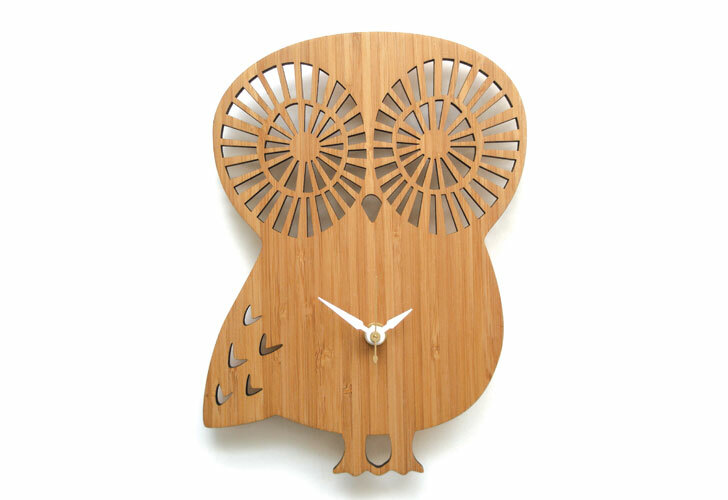 Each clock is beautiful handcrafted from eco-friendly 3-ply bamboo and feature pretty contrasting white hands. Clock surfaces are finished with natural oils for a smooth, polished look. Because bamboo pieces are naturally different, each clock features one-of-a-kind grains and colors. All clock motors are silent and made in USA. Decoy Lab uses all recyclable and reusable packaging materials too. Best of all, these eco-friendly clocks are whimsical enough for a child, but not childish, meaning they'll work well for your child's room as he grows.